It was a cold night in late November, after a clear, sparkly day that had begun with a morning shower. The wind was swirling at street corners, and Randall and Al and I all wore overcoats, and I kept mine buttoned up. Our destination was a bar, and our theme was neon, so we planned to end up in a watering hole graced by a neon sign, and we would pause to look at a few other neon signs along the way and then whet our whistles. It wasn’t quite the holiday season. The skate rink on Union Square was open, but not very crowded, and a few guys cleaned up the ice with squeegees while a tiny Zamboni did figure eights. We walked halfway around the rink and realized the subway construction was going to block our progress, so we backtracked a bit, and crossed Stockton Street before continuing south in search of some neon. Randall and Al have put out a beautiful photography book called San Francisco Neon: Survivors and Lost Icons and they are eloquent authorities on the subject. Just off New Montgomery we paused for awhile at the Palace Hotel Garage. We loitered there specifically to bask in the glow of the garage’s elegant neon signage and ornamentation. Randall pointed out neon arches tracing the garage’s entry and exit, each ending with fine little triangles, an art deco touch. Outside the garage, Stevenson Street was lit up like Christmas. The garage attendant came out to chat about the signs, proving himself to be a rare, informed enthusiast. 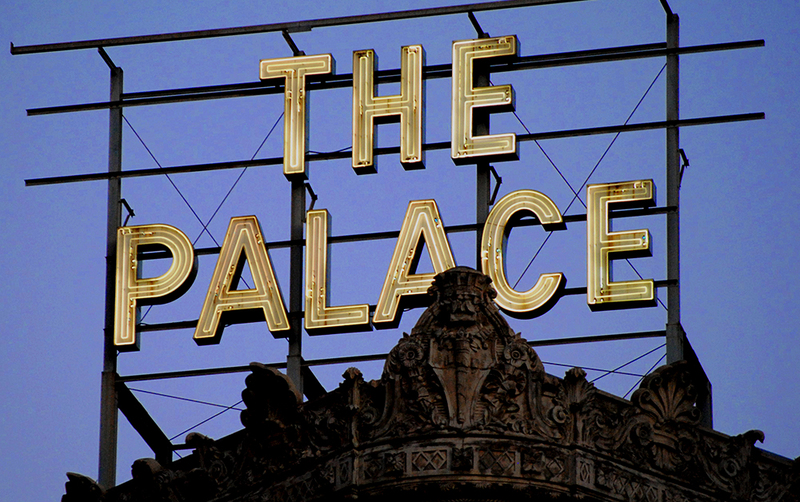 We returned to New Montgomery and again we followed the neon, and we didn’t have far to go. 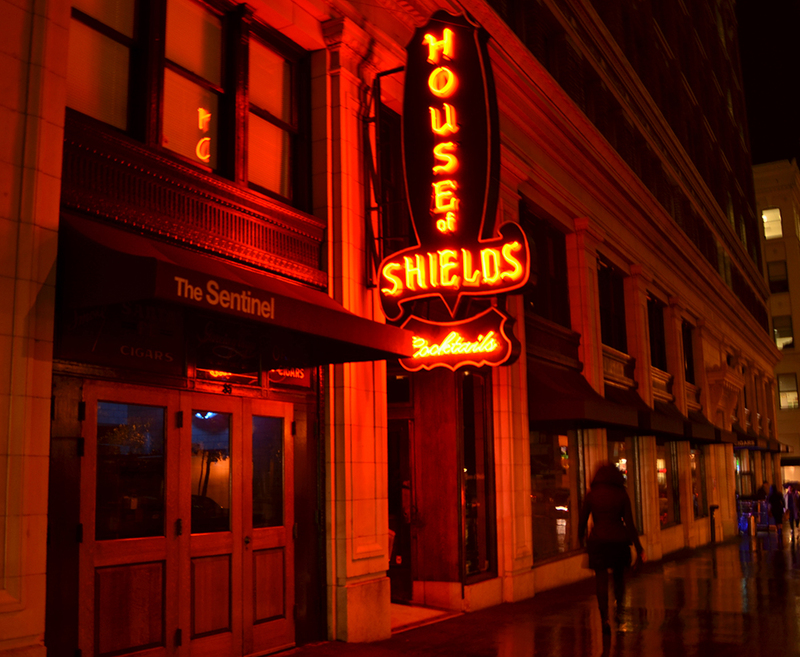 This time a sign’s gaseous glow lured us into the House of Shields, where we took three stools at the bar. It is a dark, mahogany room with impeccable, traditional tavern atmosphere. Not a TV in sight. 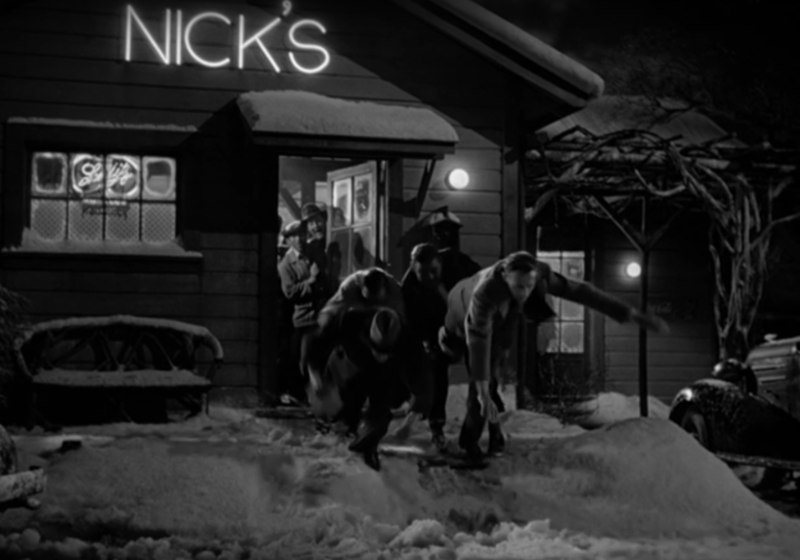 Speaking of atmosphere, there’s a particular scene from It’s a Wonderful Life, in Nick’s Tavern, identified by some simple neon lettering. Sheldon Leonard, so excellent at playing gruff Runyonesque characters, gets annoyed with the angel Clarence’s request for some antiquated beverage – “mulled wine” I think it was. “Listen, we serve hard liquor to folks who want to get drunk fast, and we don’t need any characters to lend the place atmosphere,” says Nick. Jimmy Stewart and Clarence are thrown out of the bar and into a pile of snow, while light from Nick’s neon sign pulsates on them. The main reason this is relevant is that as we sat down at the House of Shields’ bar, on a night when business was slow, Randall, after some deliberation, asked the bartender if he knew how to make a Tom & Jerry. He said he didn’t, but he was kind enough not to have us thrown out of the bar. 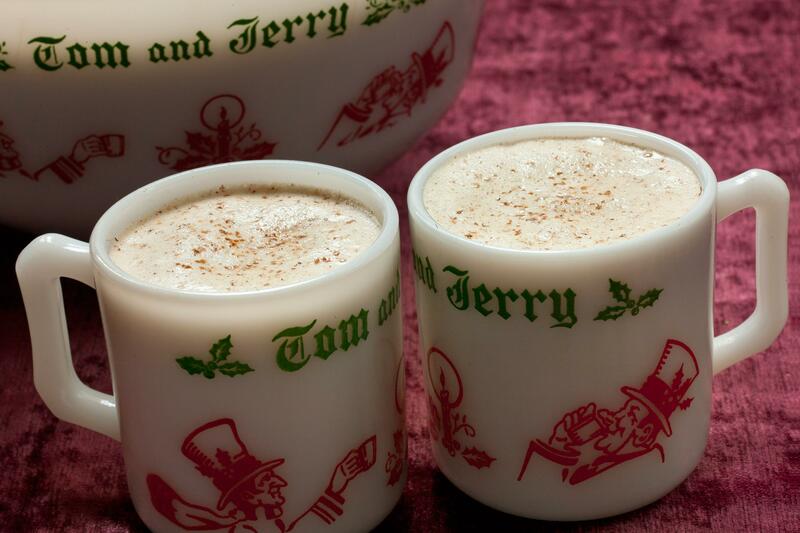 In fact, he looked up the recipe for Tom & Jerrys on his iPad, and he found it in a list of holiday drinks “you wouldn’t want to try more than once,” as he put it. If you are over the age of 75 you may recall having enjoyed a Tom & Jerry at some point. It was probably served up in someone’s home with bottles gathered up at a bar that sold packaged liquors. If you are under the age of 75, you have probably only seen Tom & Jerry cups and bowls in Goodwill stores. The ingredients, as read from the iPad by the bartender, are intriguing: brandy, rum, eggs (beaten), cream of tartar, spices, etc., heated up somehow – “very strong” according to my friend John, whose mother reportedly drank Tom & Jerrys on numerous occasions decades ago, as I learned while delving deeper into the subject the following day. But tonight, in this gin mill, it was no dice. The bartender didn’t sound overly enthusiastic, but indicated he might experiment with the ingredients and maybe come up with a new and improved version of the Tom & Jerry. So Randall and Al had Negronis, and I tried something called a Gold Rush, with whiskey, honey, and lemon juice. The drinks were very good, went down easily, and warmed us up, and after a little good humored baiting from Randall, the bartender generously shared some information about the death of Warren G. Harding, the seldom remembered 29th president, who died in the basement of this very bar. It seems the official story – that Harding had died properly in his room at the Palace Hotel – had merely concealed the embarrassing truth that Harding had succumbed here while violating the Volstead Act. As part of the subterfuge Harding, we were told, was secreted back over to the hotel via a tunnel. We forgot to ask to see the tunnel. We drained our glasses and crossed the street, taking the surface route over to the Palace Hotel, itself sporting some impressive rooftop neon. Inside the hotel we turned a couple of corners and found the Pied Piper Bar. Randall and Al ordered more Negronis and, now craving Campari myself, I ordered a Boulevardier – basically a Negroni with bourbon instead of gin. The waitress hadn’t heard of it, but the bartender knew what to do. 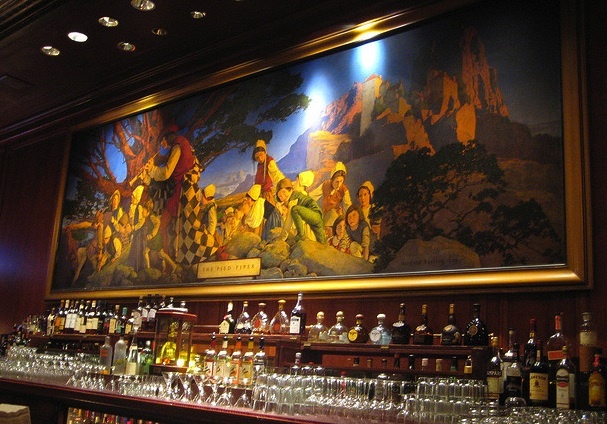 The Pied Piper is a hotel bar, and a lovely one, famous (and named for) for its mural-sized painting, which is a nice touch but, truth be told, didn’t arrest my attention for very long. I hadn’t seen it since it underwent restoration a few years back, and restored paintings always look like forgeries to me. With decades of nicotine stains washed away, the painting looked a little too shiny and new, considering that when Maxfield Parrish painted it Warren G. Harding still roamed the earth, no doubt imagining it would be swell to become president one day. The bar hopped with out-of-towners standing in groups, holding drinking glasses, recounting conference presentations they had attended during the day (or so it seemed to me). Despite lacking in regular patrons, it is a very convivial place. Hotel bars are like airports, where everyone may feel welcome as long as they don’t choke on the whopping tariffs. We each ordered a $20 burger. (It was an excellent burger, by the way…) Once in awhile it is a treat to be an anonymous carouser in a room full of people who are just passing through. 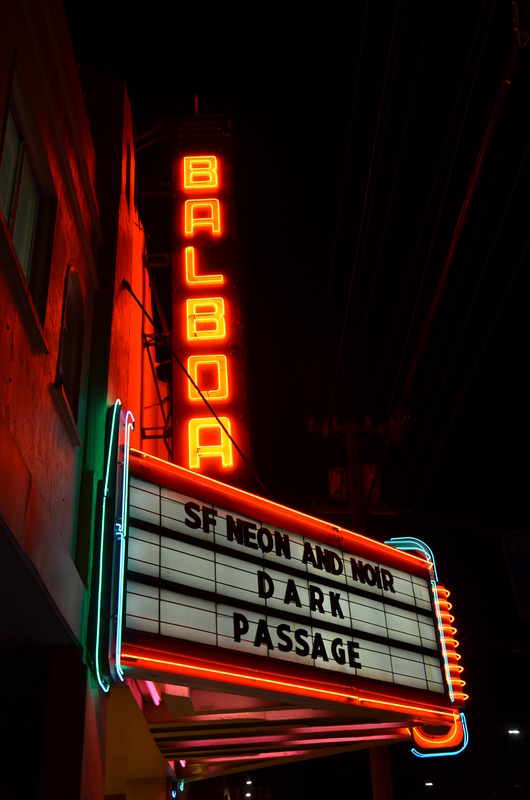 San Francisco Neon by Al Barna and Randall Ann Homan is available at www.neonbook.xyz. Foreword by Tom Downs. Randall and Al visit the podcast Roll Over Easy. The interview stats at 1:00. Check out this week’s Eat My Shorts for Stolen Moments: Neon Noir, a trailer for Dark Passage and video on how to make the cocktails mentioned in this article. Tom Downs is the author of Walking San Francisco (Wilderness Press) and an award-winning edition of Lonely Planet’s New Orleans, along with many other books and articles having to do with places, built environments, culture, and history. 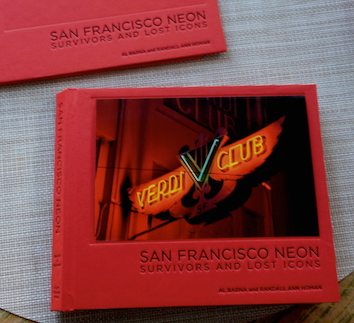 Doors open 6pm for book signing and reception for San Francisco Neon: Survivors and Lost Icons (Giant Orange Press). 7pm – PreShow and Feature: Dark Passage starring Humphrey Bogart and Lauren Bacall. An evening of neon and noir is presented by GiantOrangePress.com and EatDrinkFilms.com Magazine to celebrate San Francisco’s fabulous collection of legacy neon signs and the third printing of San Francisco Neon: Survivors and Lost Icons. There will be a festive reception and book signing in the lobby of the historic Balboa Theatre with complimentary wine and neon cocktails. 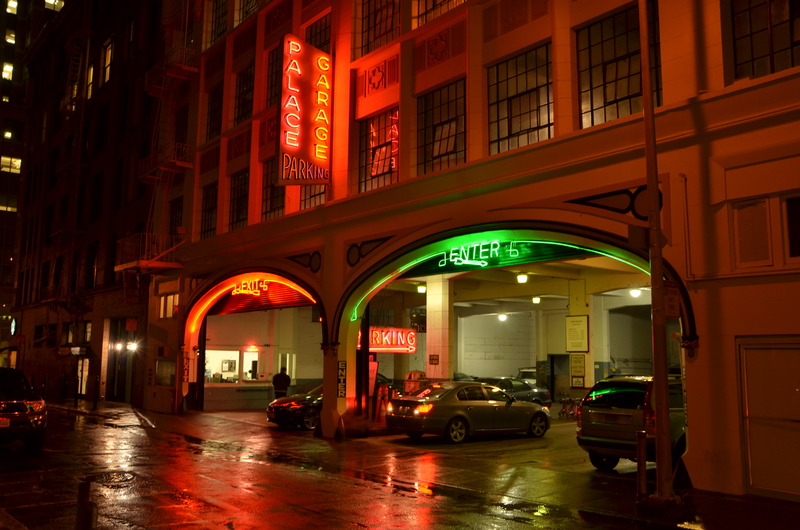 We’ll be screening a compilation of San Francisco home movies from the Prelinger Archive that showcase San Francisco’s neon heritage. There will be two short features: San Francisco Neon News on the March, and back by popular demand, our video essay of neon and noir The Stolen Moment. The evening’s feature film will be Dark Passage, a classic noir directed by Delmer Daves and starring Lauren Bacall and Humphrey Bogart. Follow framed fugitive Vincent Parry (Bogart) through the neon-soaked streets of San Francisco in 1947 as he evades the law and tries to clear his name. Irene Jansen (Bacall) proves to be a loyal friend and ally who just happens to live in a really great apartment! A kind-hearted cabbie and a shadowy plastic surgeon provide Bogart with the element of surprise that will prove to be Madge’s (Agnes Moorehead) downfall. All the way down. Don’t miss it! And look for the giant French poster for Dark Passage in the Balboa lobby. It is from the EatDrinkFilms collection. This entry was posted in Uncategorized and tagged Al Barna, Drink, Films, Maxfield Parrish, neon signs, Palace Hotel, San Francisco Neon, The Pied Piper, Tom Downs. Bookmark the permalink.